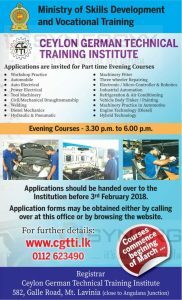 Ceylon German Technical Training Institute invites applications for the range of Part Time Evening Courses. Ceylon German Technical Training Institute is a Ministry of skill development and vocational training approved insitutute to offer short courses. Evening Courses are start from 3.30 p.m. to 6.00 p.m. Applications should be handed over to the Institution before 3rd February 2018. Application forms may be obtained either by calling over at this office or by browsing the website.